The 37th edition of the Giro del Trentino begins tomorrow. The four stage race, with the first stage being made up of two parts, will start in Lienz, Austria. During stage 2 the race will cross into Italy. Live coverage via RaiSport2 and Eurosport (and streaming links via www.cyclingfans.com) will give fans an opportunity to see Wiggins, Nibali, Basso, Evans, Scarponi, Rolland, and last year's winner Pozzovivo in action as they lead-up to the Giro d'Italia. 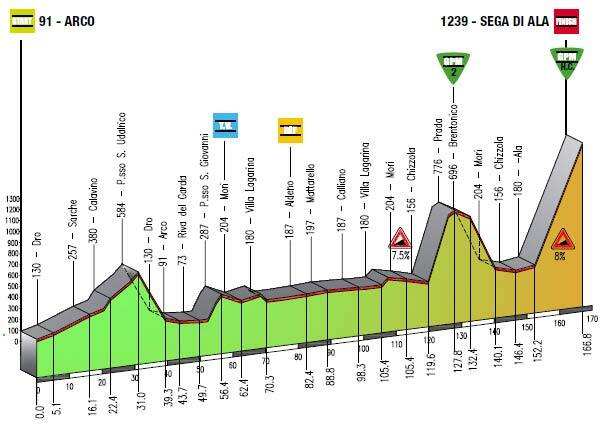 The last stage with the climb to Sega di Ala should provide an exciting finish to the race. The climb averages 9.2% with its 21 hairpin turns. The first 6 km have a 10% average which in certain parts reaches 14 to 16%. There are a series of hairpin turns leading up to an altitude above 800 m. Then there is a tunnel and the road flattens out for about 500 m around the 7th km of the climb. Then there are the 3 hardest km where the average incline is around 11.5% reaching 20% in some parts. After that the road continues to climb gently for the last 3 km leading to the H.C. KOM point and the finish line which is placed at the end of a 300 m. long and 4 m. wide straight with an approximately 2% grade.